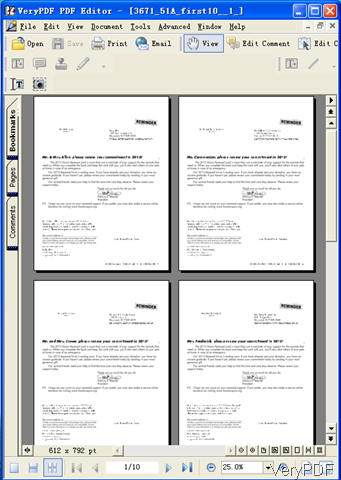 VeryPDF PDF Editor 4.1 can be used as professional PDF Viewer. When you use it as PDF viewer, it allows you to zoom in, zoom out, show actual size, fit page size, fit width and height. The most important, it allows you to show single page, continuous page and continuous –facing page. This function is extremely good when you need to compare pages to find changes or differences. In the following part, I will show you how to use this function. Download PDF Editor and install it. This software is GUI version, so you need to install it. Once the downloading finishes, there will be an exe, please double click it and follow the installation message. A few seconds later, the installation will finish and there will be an icon on the desktop. Simple click the icon to launch this software. When you click option View then you will see the dropdown list, where you can choose how to view PDF file. And there are some hot keys for you to use. If you do not like to use those “Clicks” options, you can also use the icon options at the bottom of the interface. In the following part, let us check continuous –facing page effect from the following snapshot. Viewing PDF superficially maybe is not enough, here I will show you how to get more basic information. Please click option File then go to Document Properties, then all the basic information will be shown in the dialogue box. The following snapshot is from the software dialogues box. In the Custom tab, you can customize PDF information. In the Description tab, which is shown like the above snapshot, you can add or change, title, author, subject, keywords and others. And the modified date and created data is shown here. The basic information, like PDF Producer, PDF version, file path , size, page size and page numbers will be shown here too. In the Security tab, you can get the PDF security restriction summary and the encryption level. Viewing PDF is just a slice functions of PDF Editor. what’s more, it allows you to edit these basic information in batch. You can use it as PDF basic information changing tool. After viewing, you can either save it as a new PDF or convert it to image file. More details, please pay attention to our website. During the using, if you have any question, please contact us as soon as possible. I want to purchase a PDF Viewer SDK, which PDF Viewer SDK do I need? This entry was posted in PDF Editor and tagged PDF viewer. Bookmark the permalink.